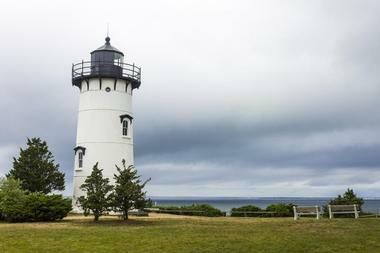 As one of New England Beaches's hottest summer tourism destinations, Martha's Vineyard is a popular spot for bikers, nature lovers, and beachgoers, with many popular family-friendly beachfront spots scattered throughout its quaint harbor towns. The island, which is only accessible via boat or plane, is the third-largest island off the United States' East Coast, spanning an area of approximately 100 square miles. 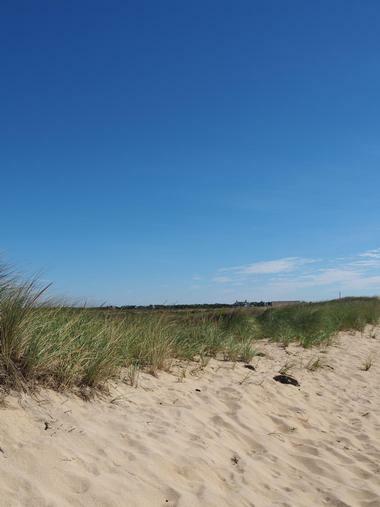 Long Point Wildlife Refuge is a spacious 600-acre wildlife refuge that serves as one of Martha's Vineyard's largest public properties, spanning beautiful dune, woodland, and beach ecosystems throughout the island that formerly comprised an Ice Age-era prairie. The refuge area, which has been used as an agricultural settlement at least since its occupation by the Wampanoag indigenous people, was the site of several elite waterfowl hunting clubs in the early 20th century before its acquisition by the Trustees of Reservations beginning in 1979. Today, it is home to one of the island's most popular family-friendly swimming beaches, along with a two-mile nature trail that explores forested areas in Long Cove, Middle Point, and Tisbury Great Ponds. Kayak and SUP paddleboard rentals are available in season, with picnic tables and bike racks provided for visitor use. Joseph Sylvia State Beach is a charming two-mile sandy beach in Martha's Vineyard that is best known as one of the primary filming locations for the iconic 1975 feature film Jaws. The state beach, which is overseen by the Massachusetts Department of Conservation and Recreation, stretches along the gorgeous Nantucket Sound shoreline and nearby Sengecontacket Pond, with an adjacent state highway providing access to the towns of Edgartown and Oak Bluffs. 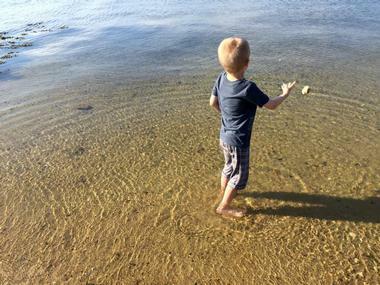 Families can enjoy safe swimming conditions due to a gradually sloping shoreline which creates shallow, calm water conditions, while anglers can take advantage of excellent fishing conditions to catch prevalent striped bass during warmer months. Visitors should note that parking spots fill up early during peak months and should plan to arrive early to secure beachfront spots. 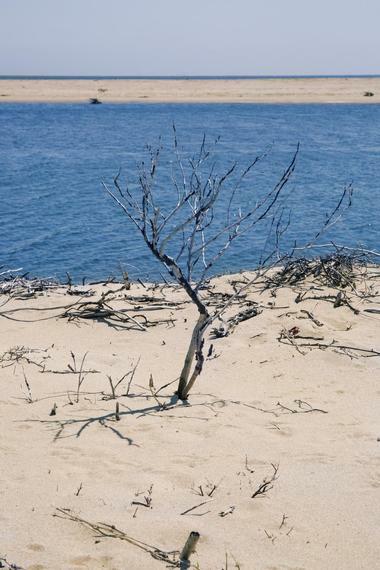 East Beach is a lovely and secluded barrier beach located within Chappaquiddick Island's Wasque Reservation, which has been cut off from the Martha's Vineyard mainland since 2007 due to storm erosion. The reservation, which was originally developed in 1959 following land donations from Oliver Filley and Charles Bird, is only accessible via boat, including public ferry service from nearby Edgartown. Visitors can relax on the shores of beautiful Cape Poge and observe the historic Cape Poge Lighthouse, which was originally constructed in 1801 and is still operated today by the United States Coast Guard. Calm, clear waters along the beach's northern edge provide habitats for shorebirds, including the endangered piping plover, along with nurseries for finfish and shellfish. Saltwater anglers can try their luck at catching bluefish and striped bass, while nature lovers can explore more than 14 miles of moderate hiking trails throughout the reservation. 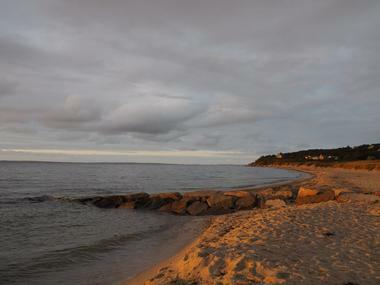 Lake Tashmoo Town Beach is a hidden gem among Martha's Vineyard beaches, located within Vineyard Haven at the point where Lake Tashmoo meets the Atlantic Ocean. 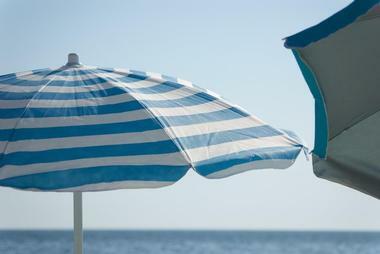 The small but charming beach is a popular local spot for swimmers and surfers alike, with calmer water conditions offered along the lake shoreline and milder surf waves accessible at the Vineyard Sound. Snorkelers can enjoy safe conditions in the beach's warm, relatively shallow waters, which also make for great family-friendly water conditions for beachgoers of all ages. Visitors should note that the beach is located at the end of a dirt road and may be difficult to find at first. Limited parking is available, so beachgoers should plan to arrive early in the day to secure parking spots. 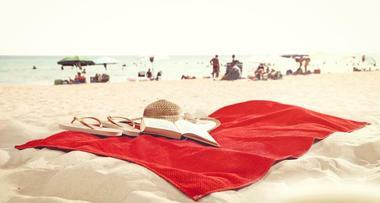 Public restrooms are available, with lifeguards staffed on duty during the peak season. Lobsterville Beach is a family-friendly beach in Aquinnah, stretching two miles along Menemsha Pond at the end of Lobsterville Road. The beach offers shallow, calm waters throughout the season, making it a perfect spot for beachgoers of all ages and swimming ability levels. 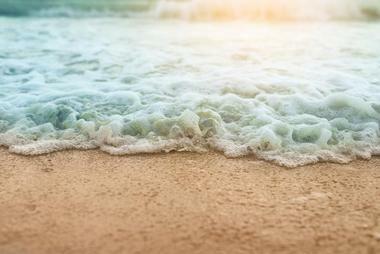 Anglers love the beach's excellent water conditions, and surf-casters and snorkelers gravitate toward the spot throughout the summer months. Birdwatchers can catch glimpses of gull and tern nesting areas past the sand dunes near the beach, while beachwalkers can stroll for miles along the Vineyard Sound landscape. Visitors should note that while the beach is free to enter for the public, its parking lot is restricted to residents only. Menemsha Beach is a popular swimming beach located within Martha's Vineyard's final remaining operating fishing village, accessible from the town of Chilmark via car, bus, or bicycle. The lovely Menemsha Harbor beach is a favorite with visiting families due to its ample visitor amenities, including food vendors selling a wide variety of coastal and American cuisine favorites and sweets. More dining options are easily accessible nearby within the town center, including restaurants serving up award-winning fried clams and lobster rolls. Safe, warm water conditions draw beachgoers of all ages, with lifeguards staffed on duty in season through the early evening hours. At dusk, the beach fills up with crowds looking for a prime spot to view the sunset from one of the island's most scenic vistas. Oak Bluffs Town Beach, also known as Inkwell Beach, is a family-friendly beach located within the heart of Oak Bluffs near Ocean Park, extending along both sides of the town's ferry wharf at Seaview Avenue. The beach is a popular spot for families with small children due to its calm waters and smooth sands, though visitors should note that lifeguards are not staffed at the site and should exercise appropriate caution. 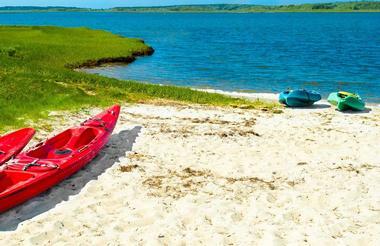 Beautiful views of Chappaquiddick Island are offered from the shoreline, which faces northward toward Nantucket Sound. Free street parking is available for visitors along Seaview Avenue, and public restrooms are available for visitor use. 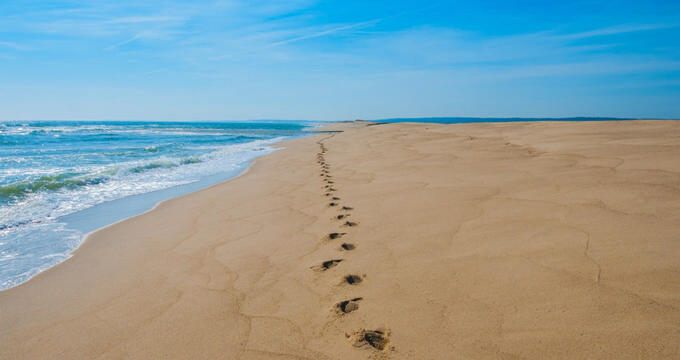 Katama Beach, also known as South Beach, is a very popular three-mile barrier beach located approximately four miles south of Edgartown along Katama Road. The beach is one of Martha's Vineyard's best spots for surfing, offering heavy waves and prime surf conditions to challenge even experienced surfers. Visitors looking to swim at the beach should check with lifeguards for current swimming conditions before entering waters due to rough water conditions at times. Sweeping dunes make for beautiful vistas, with lifeguards staffed on duty in most areas and public restroom facilities available for visitor use. The beach's left side tends to be more heavily populated with family beachgoers, while its right side attracts adults and college students. Wasque Beach is an expansive 200-acre nature reservation located on Chappaquiddick Island, acclaimed by international publications such as Travel and Leisure as one of the most beautiful beaches in New England. The half-mile beach, which was originally established as a public reservation in 1967, offers ample public amenities with less crowds than mainland Martha's Vineyard beaches, accessible via ferry from nearby Edgartown. In addition to family-friendly swimming conditions, anglers can enjoy excellent fishing conditions for catching bluefish, bonito, and striped bass. Wildlife watchers can spot blue herons, egrets, ospreys, and monarch and sulphur butterflies, particularly during migration seasons. Visitors should note that a parking fee is collected by the Trustees of Reservations, with additional fees required for driving directly onto the beach.